A "hitch" is a type of knot that must be tied around another object to maintain its structure. In the case of a Prusik hitch, it is tied around another rope. The unique aspect of a Prusik hitch is that it slides freely along the other rope when unloaded yet grabs tightly when loaded. To tie a Prusik hitch, simply tie a girth hitch around another rope (step #3 in this illustration) and then repeat the hitching process two more times. This creates a "three wrap" Prusik as shown here. The optimum number of wraps depends on the difference in the diameters between the two ropes. The greater the difference between the Prusik and the rope it is tied around, the better the Prusik will hold and the fewer wraps are needed. The closer the diameters of the two ropes, the more wraps you'll need. Three wraps is a good starting point. You can ascend a rope using two Prusiks. The upper Prusik connects to your harness and the lower Prusik connects to a foot loop. Stand in the foot loop to unweight the Prusik that is connected to your harness. Slide the Prusik that is connected your harness up the rope. 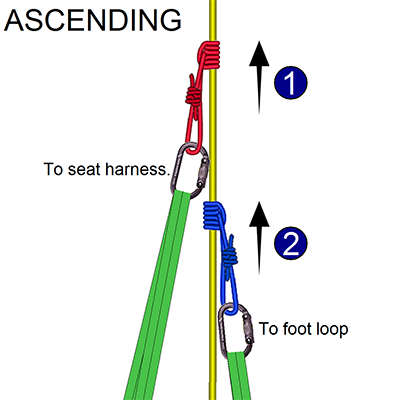 Sit in your harness to unweight the Prusik that is connected to the foot loop. Slide the Prusik that is connected to the foot loop up the rope. You can attach a Prusik hitch to the "brake side" of your descent control device when rappelling. If you accidentally let go of the rope (e.g., due to rock fall), the Prusik will arrest your fall. Learn more about this "third hand" technique. Tandem Prusik belays are frequently used to provide an independent belay during rescues. When lowering (i.e., letting out slack through the Prusiks), proper handwork is critical to ensure that the Prusiks will grab the rope and that the rescuer's hands will not be injured. In this illustration you can see that the rescuer's thumbs are outside of the rope and pointed upward.